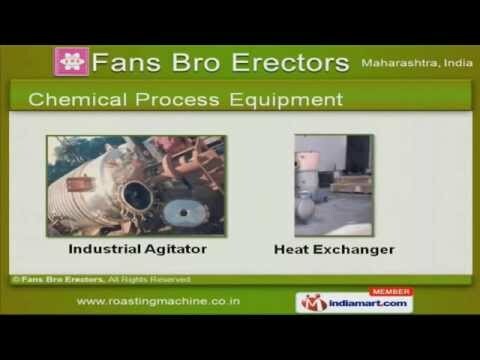 Welcome to Fans Bro ErectorsManufacturer & Exporter of Design, Fabrication, Erection & Commission of Precision MeasuringInstrumentThe company was established in 1975, at Mumbai. Our Ultra modern manufacturing plants &Premium grade raw materials help us to serve Chemical, Fertilizers, Pharmaceutical & otherIndustries. Our Assured quality & On time delivery have helped us to cater clients like - Hindustan LeverLtd. , ABB Ltd. , MTR Foods Ltd. & other companies. We offer a diverse range of Industrial Tanks, Roaster, Blending Machines & Food ProcessingEquipments. Powder Mixer, Ribbon Blender & Spice Roaster are some of the well known types of Roaster &Blending Machines. Our Chemical Process Equipments are best in the industry amongst others. We also provide Industrial Tanks that are well known for their impeccable performance. Industrial Agitators, Screw Conveyer, Spray Driers & Coating Pans are available underIndustrial Machines. Along with that we offer Food Processing Equipments that are a class apart.